Special thanks to Sir Seriouz for intergrating the save function. 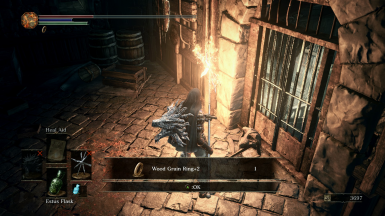 Added option to unrandomise estus and undead bone shards. Balancing: Increased frequency of goods (such as embers), and halved the maximum quantity. 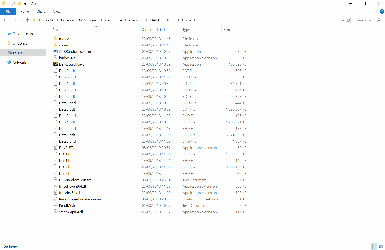 Added 200 more items to the item list, in order to prevent the list becoming exhausted. Added a little icon to the random list generator. 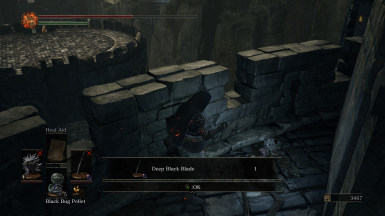 The Dark Hand can no longer be given reinforcements. The Storm Ruler has been un-randomised to prevent its spawn regenerating if you don't have it. Fixed a bug involving special weapons vanishing on pickup if you were weapon level +1. Re-added the following weapon infusions: Poison, Blood, Raw, Blessed, Hollow. Added an option in the .ini file to remove stat requirements from weapons. Fixed a bug that would give you the same item over and over again when restarting the game. Re-made the mod in .dll format (no more cheat engine). Made the mod more user-friendly. 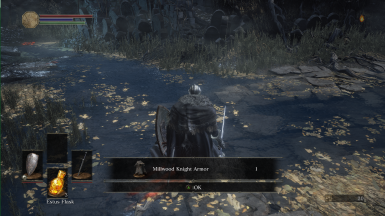 The mod now automatically saves progress, as you pick up items. Titanite and upgrade materials can no longer be self-dropped to re-roll items. The mod has been rewritten from scratch, in an attempt to make it more stable. Rewrote everything in a less dense way. Fixed a crash that occurred when you picked up over 1500 items. DLC weapons no longer auto-equip in your off-hand slot. All items are now randomised, including crystal lizards, NPCs, boss drops etc. If used online, this mod can ban you. Please do not use this mod on any account you care about. Bans are now permanent. This mod no longer uses cheat engine, in an attempt to make it more user friendly and stable, I have rewritten it and moved it over to a .dll file. This mod will randomise almost every item in the game, both items found throughout the game and items dropped from enemies. 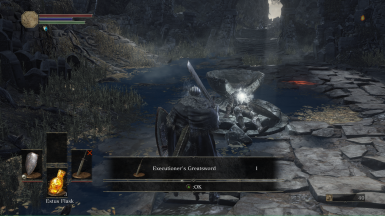 I was inspired to make this mod by the previous Dark Souls games having randomiser mods for them and saw how much more variety and replay-ability they add to the game. There is also an optional script which will automatically equip weapons, armour and rings as soon as you pick them up, in their appropriate slots. This is the main part of this mod. 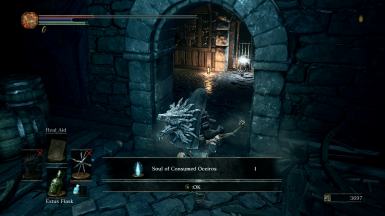 Unlike other randomisers in the previous souls games, this one will draw from a pool of every item in the game -- Regardless of whether it can be found normally or not. Note that there are a few key items in the game that are not randomised. Once you get an item, the item will be removed from the pool and you won't be able to get it again, note there are more than 1 of certain items (such as embers and resins). There is a save/load feature included to preserve your progress if you wish to use it. If you do not save your progress then all items will become available in the pool again, including key items such as NPC ashes. Soft-lockable items are not randomised. Weapons have a chance to be normal, infused, reinforced or both with this randomiser. The way this works is you cannot get a reinforcement level higher than your maximum, for example if you've only had a +4 weapon normal weapon as your highest upgrade, you can get anywhere from +0 to +4 weapons from drops. There are 1600 items on the list - when this is exhausted the mod will default to a random pool of any item in the game. Randomising estus and undead bone shards is toggled ON by default, if you do not want this, set the "RandomiseHeals" option in the .ini file to false. 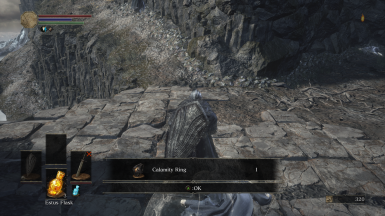 This part of the mod is optional it will, as it's name suggests, automatically equip any armour, rings and weapons that you find. This part of the mod was kept separate because not everyone will want to use it, it adds more a significant challenge to the whole game as you have to adapt to your current equipment. There is also a script to remove all requirements from all weapons should you wish to use it. The script will cycle through ring slots, from 1 to 4, and then reset back to 1. This means that the ring you've had on for the longest will be replaced by the next ring you pick up. Auto-equip is toggled ON by default, if you do not wish you use it, set the "AutoEquipToggle" option in the .ini file to false. Q) Does it save my progress? A) Yes, after every item you pick up, the item pool will update to remove that item so you won't get duplicates. Q) Does this mod work with pirated/old versions of the game? A) No, these have different memory structures to up-to-date, legitimate copies of the game and the mod won't work properly. If you are worried about soft-bans on your main account then I suggest that you play on an alternate, family-shared steam account. Q) Can I use the auto-equip script on its own? A) No. It relies of components of the randomiser script. A) Key items needed to progress through the game, for example the Basin of Vows and Lord Cinders, in total this makes around 22 items. Q) Does this mod work with *insert mod name here*? A) As long as the other mods don't use DINPUT8.dll, it should be fine. Q) Auto-equip sometimes doesn't work. A) Items won't auto-equip if your character is doing certain animations (e.g. rolling or attacking). Q) I have a question not listed here/ have identified a soft-lock problem! A) I am happy to answer any questions and will happily fix softlock problems that are reported, send me a message or make a bug report about it. Q) I have a suggestion for the randomiser. A) Make a post or send me a message, I'll look into it to see if it's possible and let you know, thanks! 1) Download and extract the .zip from this page. 3) Run AoBRandomiser.exe, and generate a seed, this should make a .txt file containing the seed. 4) Launch the game, you should get a prompt on load to confirm that the randomiser is active, you must press "OK" for the randomiser to activate. 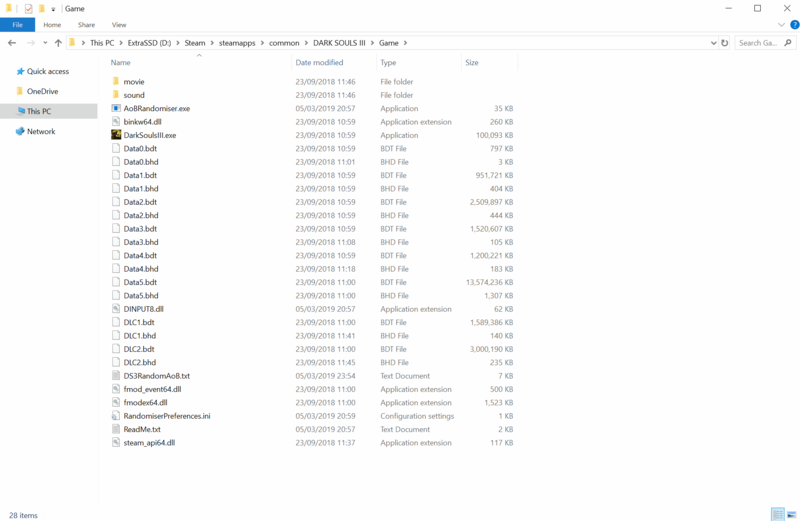 To remove the mod, just delete the "DINPUT8.dll" file from your DarkSoulsIII.exe directory.